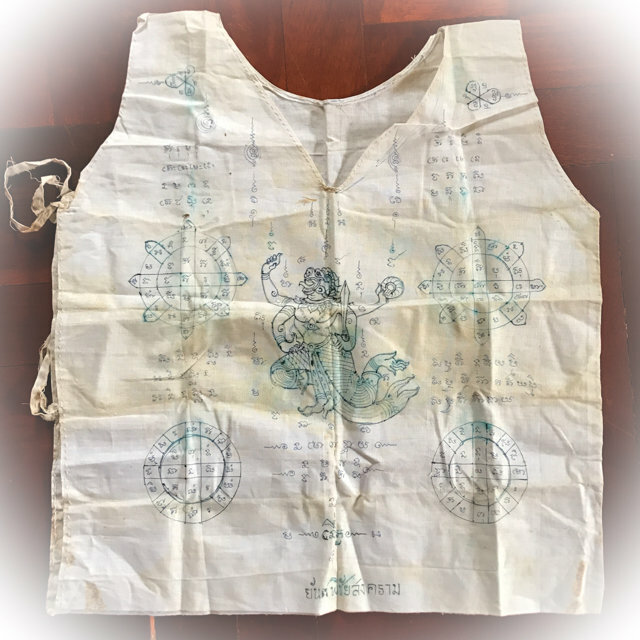 Proudly presenting an Extremely Rare and Sacred Suea Yant Pichai Songkram War-Winning Yantra Shirt of Victory with Hanuman as Central figure, hand inscribed by the Late Great Sak Yant Thai Temple Tattoos Master, Luang Por Guay Chudtintaro, of Wat Kositaram, in Chainat. The Yantra are inscribed on white cloth by hand in ink, and are extremely neatly written and composed, with very clear Khom Agkhara lettering, as was ubiquitous with the inscriptions of Luang Por Guay, who was extremely diligent with his techniques of inscription. The Yant are composed perfectly into a Wicha Pichai Songkram War-Winning Magical Compendium, with various Sacred Yant. Please Note; this Yantra Shirt is small in size and will not fit larger persons. It can be used for Bucha, folded and carried, or in the case of small persons, ladies or children can be worn. We estimate that a person not over 168 Cm with slim body would be able to wear the shirt. Amongst the spells written upon the shirt, are various Yant See Liam on the rear side of shirt (Magic Squarers) with Elemental Invocations, and Yant Duang (round Yantra for Karmic Influence and Protection), Sacred Na Spells, Yant Ongk Pra (Pra Pakawambodee Pid Ta), and Incantations for Kong Grapan Chadtri, Klaew Klaad, Maha Amnaj, Maha Ud, and Chai Chana Magic to invoke invincibility, imposing effect, and repel weaponry and blows, and Victory against all Opponents. The Hanuman Yantra provides increased strength, agility and stamina, the ability to get up again and fight when knocked down in life (repeatedly). Hanuman increase fast-wittedness too to react in time, as well as status increase and Invincibility. Hanuman is the son of the Wind God Vayu and the Lady Svaha, and if killed, can be revived back to life if the wind blows on him at any time. Hanuman is Hence Invincible, and cannot be Killed Ultimately. Luang Por Guay was an Ajarn Sak who was very dedicated to the creation of authentic amulets using the ancient traditional Wicha. His Sak Yant did not have much Khom Agkhara lettering embellishing it at all, and were usually one single Yant. Sometimes small, or sometimes large enough to fill the whole back. Most Looksit would only come and get get Sak Yant once, or twice. At the most, three times would be the maximum that a Looksit would come to add. His compendium would begin the composition as follows; the first Yant would be a Yant in the middle of the chest, and one more Yant on the back. If anyone wished for extra they could return and get more. If he laid more on, he would place Hanuman on the flank. If that wasn’t enough for them, he would add a tiger. But there were very few Looksit who ever got the tiger. Luang Por Guay's amulets have reached the highest level of respect and collectorship in their history now, and are considered to have noticeable effects that are felt be everybody who owns and wears one of his amulets. The stories of confirmation of their power are more than can be counted, and his great Patipata and Exceedingly Powerful applied methods of Sorcery are a large part of what attributes to their power. His amulets are now extremely rare to find because those who already own any will never wish to part with them again, and they are hence becoming one of the rarest kind of amulets to find these days. Hanuman is the symbol of Loyalty, for his unwavering dedication and selfless service to Prince Rama as told in the Ramayana. Hanuman is very charming, super strong, invincible, cannot die, wily and clever, and is the commander of all the Vanora Devas as their General. Hanuman can not only protect from dangers, black magic and ill fate, he can also bring winners luck to gambling tables, is an able seducer of maidens and nymphs, and is more or less a winner in every walk of life. His strength is immense and second to no God, for which reason he is the mascot and revered Deity of Muay Thai Warriors, who call upon the power of Hanuman to defeat their contestants and opponents in battle in the ring. The Winning Power of Hanuman, will clear the way of difficulties, whilst making all ventures successful. Hanuman is a highly recommended Wicha for practitioners of Muay Thai, and those who are in competitive professions and pastimes, for winning over all your peers, enemies, obstacles and contestants. There are a multitude of different specialized Kata for chanting to the Hanuman Deity in Thai Buddha Magic. Each Kata can be used for your different needs or time available. The Hanuman Deity brings not only Invincibility, Charm and Victory, but also induces Lucky Fortunes for Serm Yos (Promotion of Status), and Increase in Intelligence and Fast-Wittedness. Hanuman is the symbol of Loyalty, for his unwavering dedication and selfless service to Prince Rama as told in the Ramayana. He is a General of Rama's army, and hence possesses immense Maha Amnaj commanding power over his underlings. The Yant Duang Pichai Songkram, is traditionally when used by Royalty or the State, a Sacred Geometrical design in the form of a Chakra which is created using a complex series of Astrological criteria to apply corresponding powers in order to deviate the inauspicious influences, or increment the auspicious factors, in order to come out winning the situation. Below; The ancient Royal State version of a Yant Duang Pichai Songkram, which differs from that of Luang Por Guay, which is more specificually empowered for warriors and those who need personal protection and victory, more than for a National Scale. The word 'Duang Pichai Songkram' in truth means 'The Astrological Yantra which wins Wars' - The Original Duang Pichai Songkram comes from a Historical Legend of Siam, where the Greater Arcana Version of the Yant Pichai Songkram was used by the Armies of Siam to win the War against the Burmese, despite being outnumbered. Using these three Wicha to create the design, the Master Mages would then conjure up a Pra Kata using 'Nam Puttamontr' (prayer water empowered with the mantras of monks chanting in meditation), to activate the Dang Pichai Songkram Yantra. Wicha Duang Pichai Songkram is useful solution to all of the following predicaments; You wish to have Charm, and be loved, You are feeling down because your lover has left you, Your relationship is full of trouble and strife, and no happiness in life, suffering the results of black magic, without knowing who did it, An enemy always steals the things you love or care about, and always standing in your way, Your horoscope will be improved, jealous people try to harm you, you are always failing, and surrender easily, work never turns out right, and everything always goes wrong, debts flood over, never enough money, and can't find a way out, it wipes out black magic in people and in the household, protecting from poverty and increasing wealth, if you ever had an abortion, or cannot find a way to survive, or bring anything to completion, it clears old Karmic negativity from present and previous lives, you work so hard for your boss, but he doesn't see the worth of your efforts, or you have bad luck in romantic affairs and are constantly being fooled. The Dtamra Yant Duang Pichai Songkram, and the Historical Legends it carries, are recounted in Buddha Magic Issue 4, a series about Thai Buddhism Occultism and Amulets, authored by Ajarn Spencer Littlewood, and which is available on the Buddha Magic Multimedia Network. Luang Por Guay was famous for his immensely diligent and complex manner of empowering (Pluk Sek) amulets, which involved daily empowerments at various times of day namely at dawn, morning, midday, afternoon, evening and midnight. His method involved the choosing of the 'Reuks Mongkol' Buddhist Auspicious alignments, the 'Reuks Jone' (Gangster Alignments) Inauspicious Alignments, and the 'Reuks Bun Paya Marn' Demonic Influential Alignments. This means that it did not matter who wore his amulets, Good people would wear them, Gangsters would wear them, anybody could wear them without loss of magical effects. In addition, he would perform empowerments during the various 'Reuks' (Astrological Influential moments), to bring total coverage of protection and fortuitous blessings to all who might wear and Bucha his amulets.